This is one of the essential ingredients that you find in the Indian cooking especially in the South Indian cooking. The leaves are consumed as herb and the seeds as spices. Fresh coriander leaves are mainly used for garnishing, and you might have noticed it many recipes. Ground coriander or coriander powder is the one which I use in almost every other recipe. This has nutty, citrusy flavor. The fresh ground coriander is so warm and intense. Coriander seeds are like spherical shaped small sized balls has the soft ridge-like structures with yellowish brown color. This tastes slightly bitter but plays well when combined with other Indian spices. The ground coriander is used mainly to thicken the gravy and to add the flavor. This has anti-inflammatory property and helps to control diabetic. The recent study shows that it lowers the cholesterol effects and it also regulates the blood sugar. 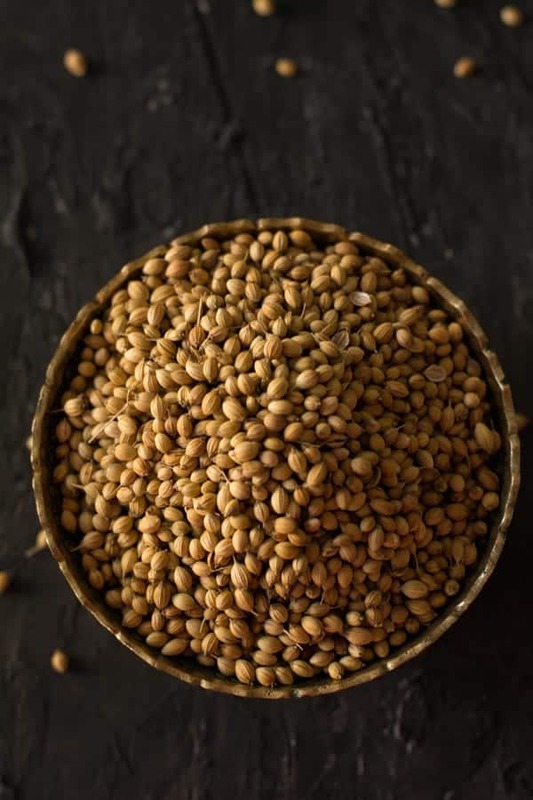 The regional names for coriander seeds, it is called as vara kothamalli in Tamil meaning dry coriander, dhaniyalu in Telugu, dhania in Hindi. I’m seeing other websites are mentioning about the substitutes for the coriander seeds. But the truth is coriander seed cannot be substituted with any other closely related spices. This has a unique and brilliant flavor that’s unimaginable to compare with other spices for the replacement. Coriander can be consumed spice or in the ground form. Using coriander seeds: Using them as the whole is good. However, gently crushing them would enhance the flavor more and excellently merges with the food. Using ground coriander: You may use the store-bought ground coriander instead you may also make your own. This much easy, budget-friendly, on top of it, this more flavorful comparing with the store-bought version. You will accept me only after trying these two versions by your own. Dry roasting method– dry roast the seeds in a pan. Allow it to cool. Toasting allows the seeds to robust the flavors. Grind it using the spice grinder or use mortar and postal. Sun drying method-If you are in the tropical region and have bright sunshine. I would suggest you try this sun drying method. For this, simply spread coriander seeds in the large tray and keep it in a place where it can receive maximum sunlight. One day of drying is enough for grinding. You may store ground coriander made with both these method for up to a couple of months in an airtight container. Coriander seeds are available now in the leading grocery stores nationwide. However, if you have Indian stores nearby, I suggest heading over there, where the spice would be the lot fresher and budget friendly. A big bag of coriander seeds will cost you a couple of dollars in the Asian or Indian stores. Online stores are also a great place to locate fresh coriander seeds. Coriander Rice, this rice is made with coriander leaves and great rice recipe perfect for lunch boxes. Healthy and delicious rice. Coriander Chicken, This chicken recipe made with fresh leaves, perfect for dinner. Can be served as a side dish or stand-alone main course. Chicken breast with coriander leaves, This recipe is easy and quick. Perfect for weekday dinners. Tomato rasam, a traditional and authentic rasam recipe belongs to Tamil cuisine. Best to serve as a side dish for rice. Udipi sambar, An another side dish from famous Udipi cuisine. Perfect to be served as a side dish to the rice. A healthy everyday recipe perfect for all ages. Masala raita, A side dish made with plain yogurt where ground coriander is used as a flavoring agent. potato cutlet, a tasty appetizer recipe where this spice powder is used to enhance the flavor and the taste of the cutlets.